Producers of the hugely successful James Bond film franchise have chosen British actor Daniel Craig to take over the role of the suave spy. The 37-year-old has been offered a three-film deal by Bond producer Barbara Broccoli and is expected to sign up formally in the next few weeks, the Sun newspaper reported. Craig, a tough-looking actor who has made appearances in art-house titles and blockbusters such as Lara Croft: Tomb Raider, beat fellow Briton Clive Owen for the role. Craig would be the sixth Bond in the official series of films based on the novels by Ian Fleming, following Sean Connery, George Lazenby, Roger Moore, Timothy Dalton and most recent incumbent Pierce Brosnan. According to the Sun, Owen -- nominated for an Oscar this year for Closer -- had told casting agents he did not want the job, although Broccoli was already favouring Craig. 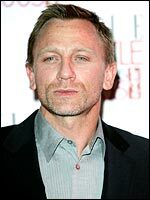 While Craig remains relatively unknown outside Britain, he is well respected as an actor and also has the necessary reputation for being something of a Bond-esque ladies man, having recently dated supermodel Kate Moss. Citing an unnamed 'movie source,' the Sun said staff working at Eon Productions, which makes the Bond movies, had been told Craig would star in the next films.